On August 31st, 2012 Oculus closed a successful Kickstarter campaign raising $2.4 million to develop their VR headset. Yesterday they announced a sale to Facebook for $2B. Let's play the "What If" game and pretend their 9522 backers were investors – how much would their investments be worth today? Probably about 145x. After their crowdfunding campaign they went on to raise a $16M Series A and then a $75M Series B. I don't know what the valuation of those rounds were but as a general rule of thumb startups tend to give away 15-25% in venture rounds. I'm going to assume 15% for both, making their Series A and B pre-money valuation of about $90m and $425m, respectively. Okay great. So in this universe what would've happened if you invested $1,000 during the crowdfunding campaign? Your $1,000 would have started as "convertible debt" until it converted the day Oculus raised its Series A. Since the Series A valuation is above the $15m cap on your note, your $1k converts into equity as if the Series A valuation is $15m instead of $90m. Collectively all the seed investors own 16% ($2.4m / $15m) of the company before applying the Series A investment, so your $1k investment converts to 0.00567% equity of Oculus after the Series A. This sounds pretty small but your investment is worth about $5.1k. Six months later Oculus raised their Series B diluting your hypothetical stake by 15% to about 0.00482% of the company, but the higher valuation makes your investment worth about $20.5k. Fast forward to Oculus's $2B sale to Facebook. 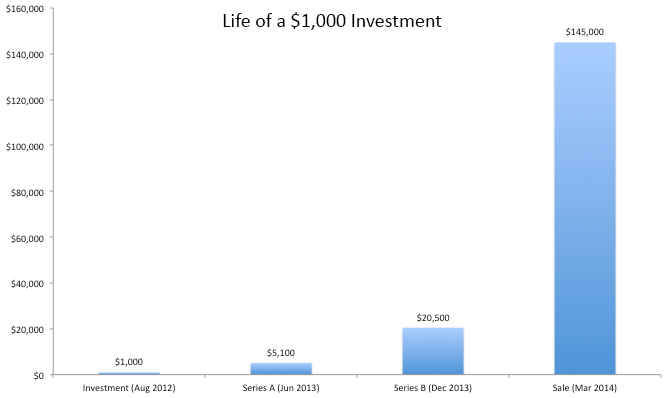 Since you own 0.00482% of the company your $1k investment is now worth $145k. That's a 145x return on your $1k in less than two years!